(B) Systems of the Body - Welcome to Miss Cuje's Science Class! Big Idea: How do these systems work together? Digestive System: In charge of food. 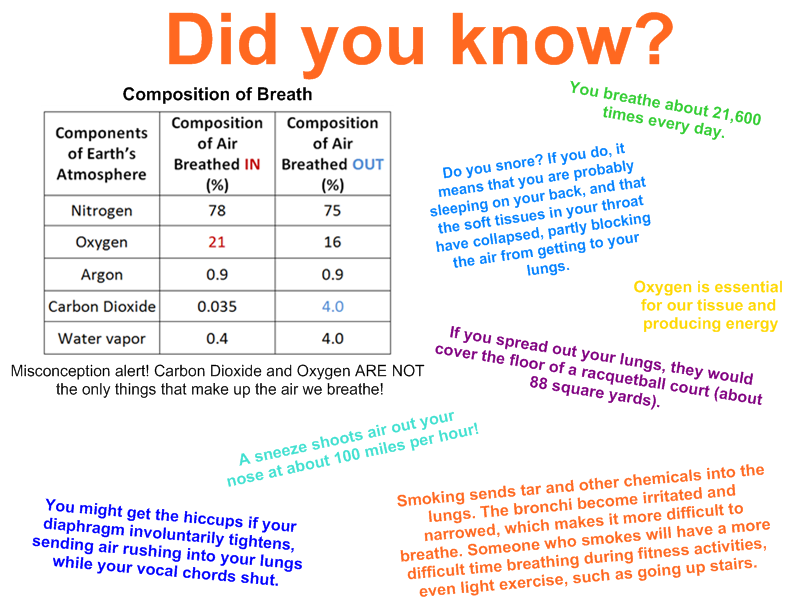 Respiratory System: In charge of breathing. dioxide is the waste from bones growing, muscles moving, and food digesting. Oxygen comes in our bodies and carbon dioxide leaves it (plants are opposite). Oxygen and Carbon Dioxide are exchanged in the smallest part of the lungs, called the alveoli, by passing into and out of the blood stream. When the body is in motion, it needs more oxygen to move. Therefore the quicker our muscles are moving, the more oxygen we need. You may notice how you start to breathe heavier when you increase your level of activity. The heavier breathing is so that your body can get more oxygen. Your heart, which pumps blood carrying the oxygen to your muscles will also work harder. Respiratory Reading: "How You Breathe"
Circulatory System: Blood acts as a delivery system. Blood flows through every part of the body dropping off Oxygen and picking up Carbon dioxide. Nutrients (from food) are also carried by the blood cells. Think of a blood cell as a boat, the blood stream as the river, and Oxygen/ Carbon Dioxide/ Nutrients/ Waste as the cargo. The heart acts as a pump to keep the "river" moving around the body. The heart has four chambers. The blood, very high in carbon dioxide waste, comes into the heart and gets pumped to the lungs to be exchanged for oxygen. The blood, now rich in oxygen returns to the heart to get pumped back out to the body. It creates a pattern: Heart, Lungs, Heart, Body (body meaning head, arms, legs, organs, etc.). Veins and arteries are the "highways" that blood travels through. Arteries (A-Away) brings blood away from the heart. Veins bring blood back to the heart. Heart Disease: When the heart cannot work properly, it can severely affect other parts of your body. heart attack. Scientists and doctors have developed ways to fix heart problems such as bypassing the clogged artery, essentially adding a new path for blood to get around. Risk factors are habits or environmental conditions that can cause an individual to develop a particular disease. Some risk factors are voluntary, meaning the person chooses to do them, while others are nonvoluntary, meaning the person cannot control it. *Students will need to explain voluntary choices one can make to reduce their risk of heart disease. Here are some websites that could help- Just click on the tiles below.